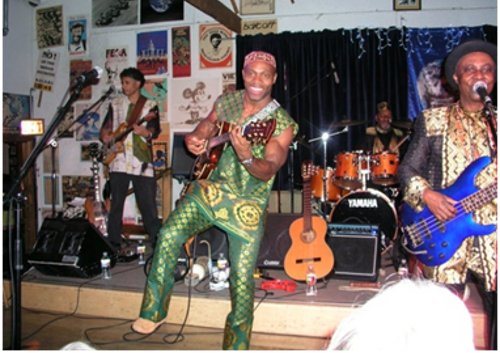 Adesoji "Soji" Odukogbe hails from Nigeria, and has the distinction of being a member of Fela Anikulapo Kuti's Egypt 80 band in the 1980's as Fela Kuti's lead guitarist. Since settling down in the SF bay Area, Soji has been active in the African music scene, and is a founding member of The Afrobeat Connexion and The Nigerian Brothers, as well as being a side man for various acts, such as The West African Highlife Band and Kotoja. He has recorded and played with Femi Kuti, Babatunde Olatunji and Orlando Julius Ekemode, among others . Soji & The Afrobeat Band is Soji's solo project, featuring a ferocious 10-piece plus band playing pure Afrobeat a la Fela Kuti - including a smoking horn section, intricate vocal harmonies, and a dance inducing rhythm section. Mixing in his own originals as well as some covers of Fela Kuti's visionary music, Soji & The Afrobeat Band provides a pure Nigerian Dance Party - guaranteed to get your feet and hips moving!